Notes: Pierre-Harry Mewesen, maître ebéniste in 1766. 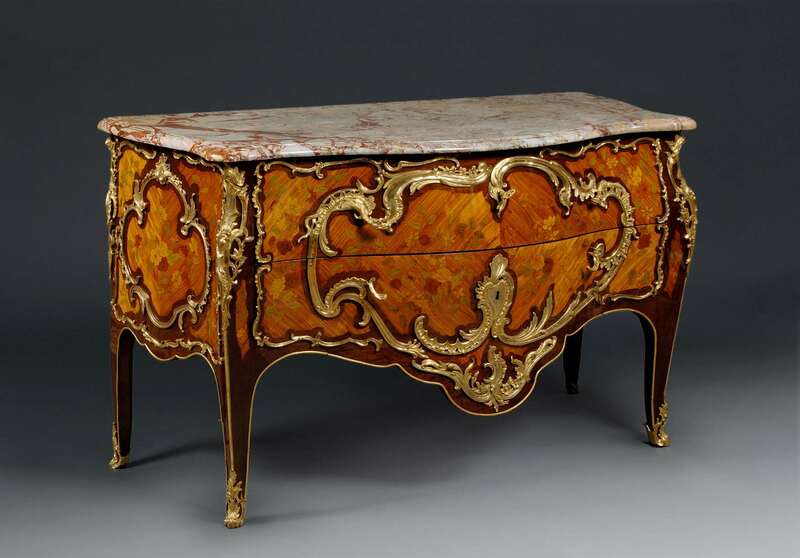 Originally from Scandinavia, Pierre-Harry Mewesen worked in Paris and produced high quality furniture in the Louis XV style, as well as transitional and Louis XVI pieces, including commodes, bureaux, secretaires and encoignures. 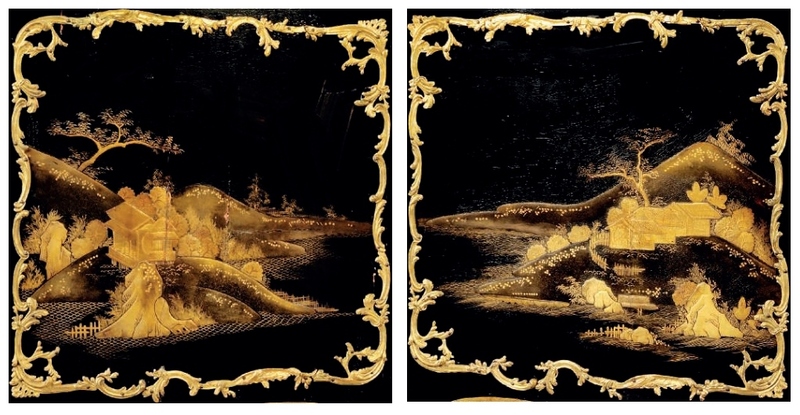 Many examples of his work are decorated with marquetry depicting flowers, musical instruments and trophies and his mounts are usually restrained and discreet. 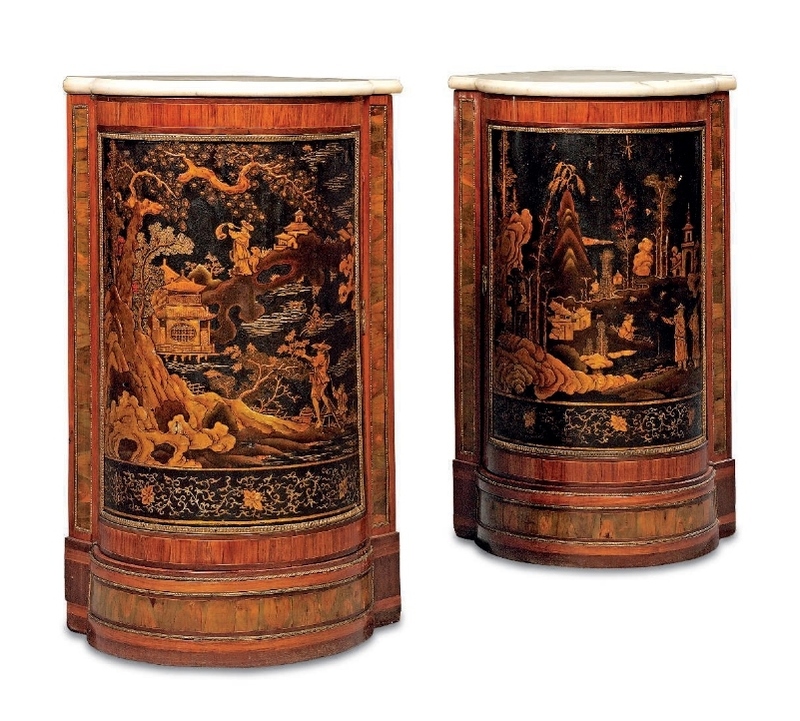 Some of his rarer pieces include oriental lacquer and Vernis Martin such as these encoignures. 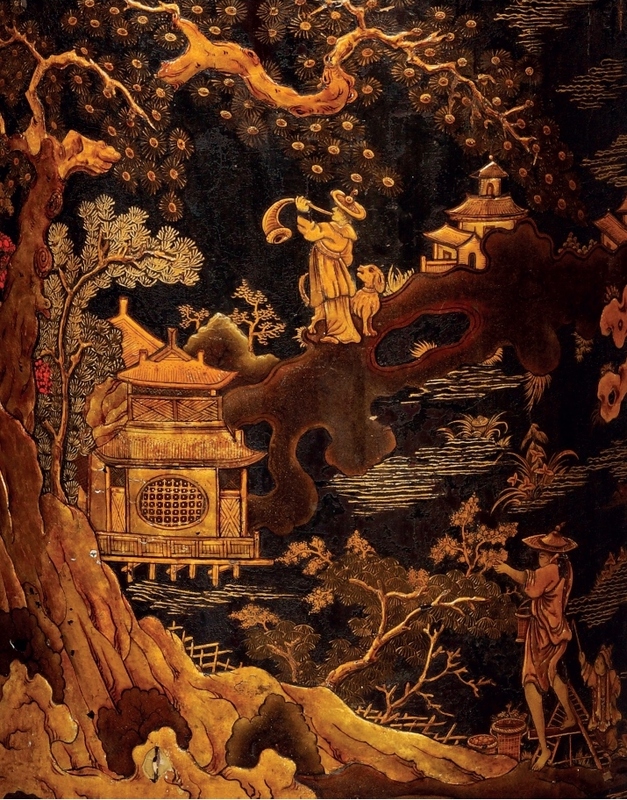 A closely related secrétaire à abattant with Chinese lacquer and japanned panels, which demonstrate the less common use of lacquer depicting Oriental landscapes, was sold by the descendants of Daniel Grand d’Hauteville (1761-1818) from Château d’Hauteville, Vevey, Switzerland, at Christie’s, London, 30 September 2014, lot 22. Provenance: Antiquités Masi, Bealieu-sur-mer, from whom purchased by Principessa Ismene Chigi Della Rovere in 1975. 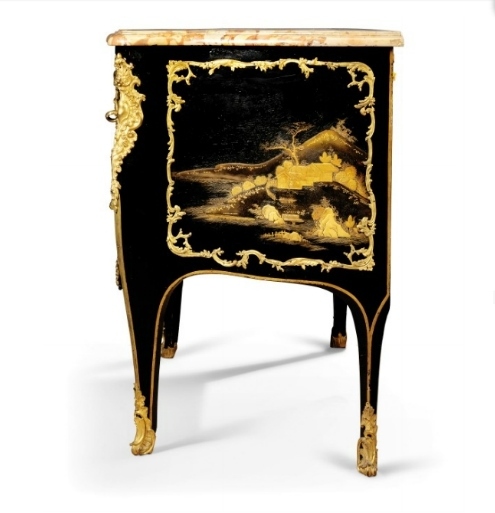 Note: This elegant Louis XV commode dates from circa 1740 and illustrates both the European passion for using materials from the Far East and the Parisian taste of transforming such materials into the most luxurious pieces of the time. 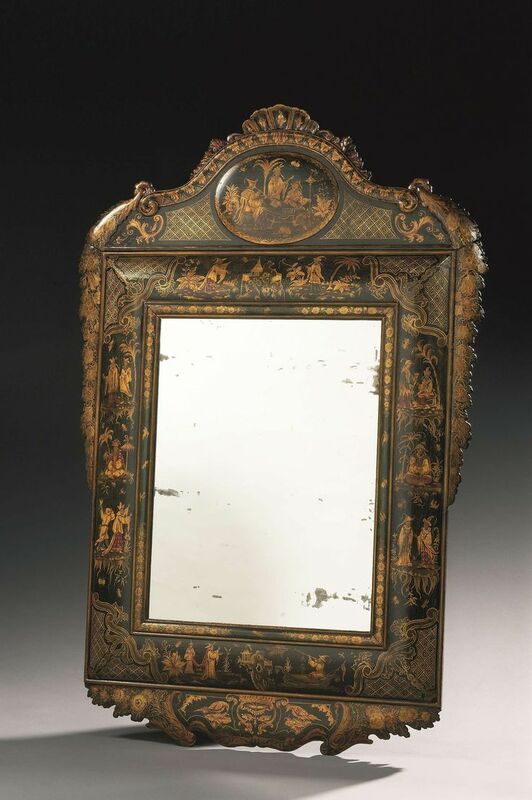 This fashion of mounting lacquer onto furniture was promoted by the marchands-mercier of Paris in the 1740s and 1750s, such as Lazare Duvaux and Thomas-Joachim Hébert. 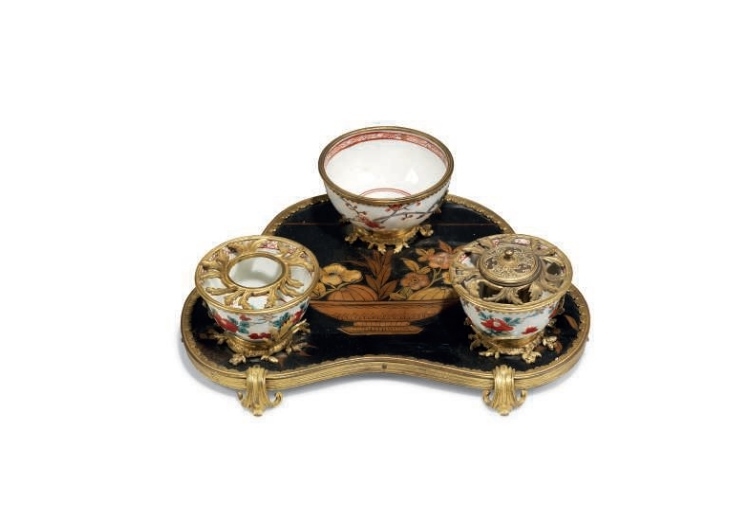 These marchands-mercier held a monopoly on the import of such precious goods from the Far East as lacquer and porcelain. 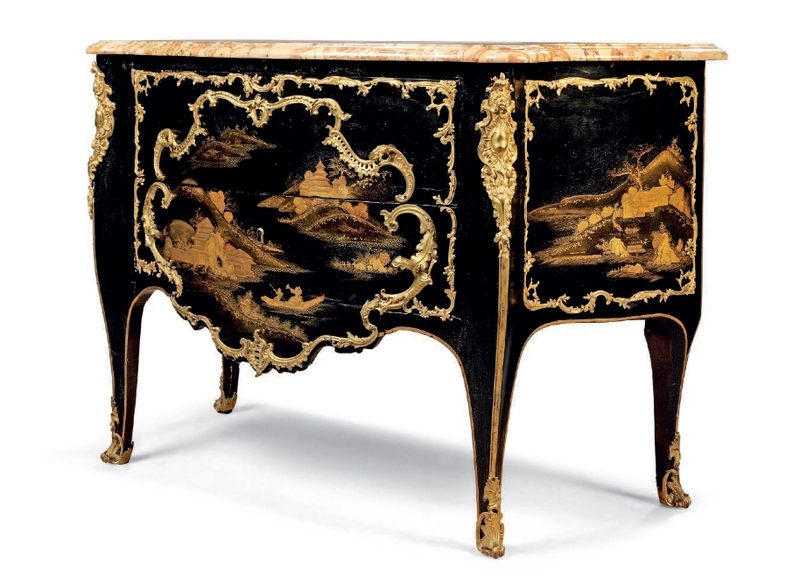 This commode, decorated with Vernis Martin panels, is a demonstration of the Paris fashion for creating decoration in imitation of Oriental lacquer, due to the increasingly high cost of imports from the Far East. Vernis Martin was created by the Martin brothers, Guillaume and Etienne-Simon, who were instrumental in developing the technique. 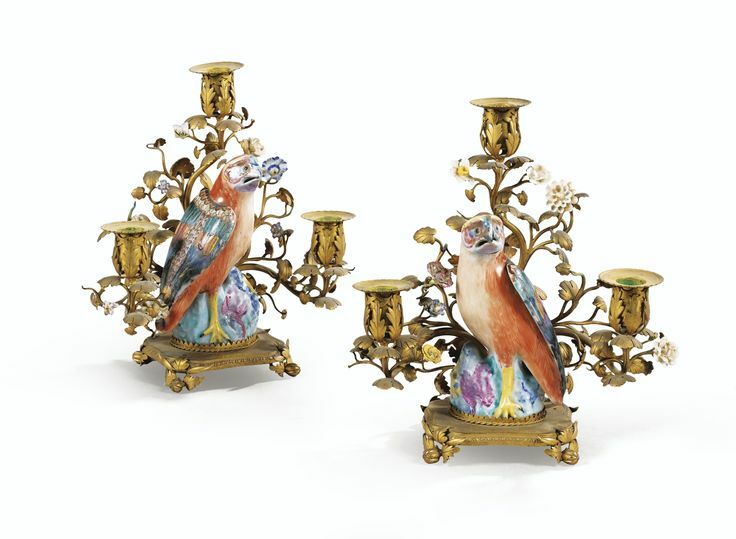 Paire de candélabres aux Faucons en porcelaine polychrome, Chine, époque Qianlong (1736-1795), à monture de bronze doré de style Louis XV. Estimation 8,000 — 12,000 €. Photo Sotheby’s. 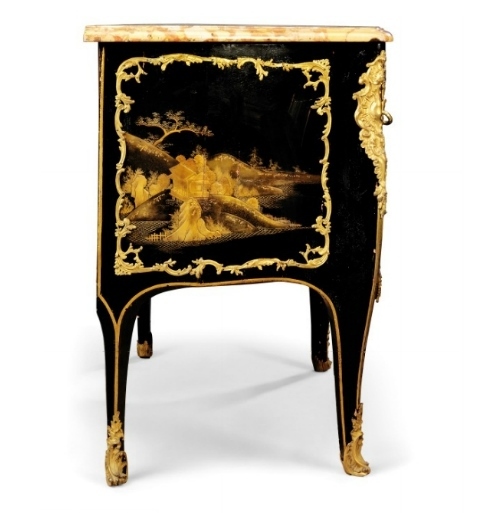 Marella Rossi, antique dealer at the prestigious Aveline gallery, place Beauvau in Paris and Christophe de Quénetain, antique dealer and art historian, are pleased to participate in The 2015 European Fine Art Fair in Maastricht – TEFAF-Maastricht – stand 218 on the Champs Elysées. They will pool their expertise and passion for art by exhibiting masterpieces from the 17th, 18th and 19th centuries displayed in an interior artichecture and booth scenography designed in 2014 by Pierre Yovanovitch. 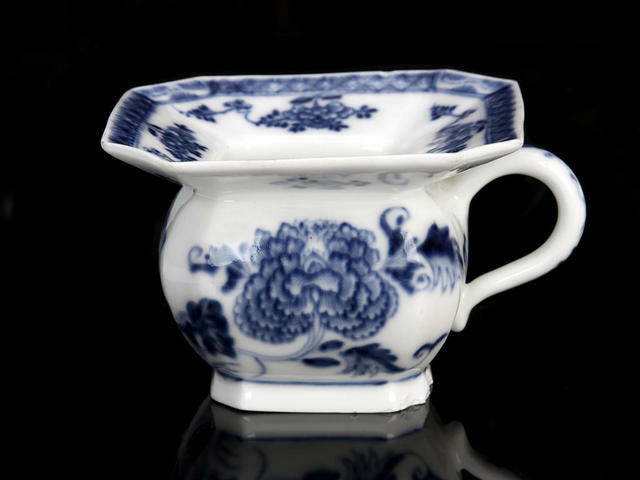 A Meissen blue and white spittoon, mid 18th century. Estimate £500 – 700 (€650 – 910). Photo Bonhams. Note: A very similar example is illustrated by John Sandon, Meissen Porcelain (2010), p.36. 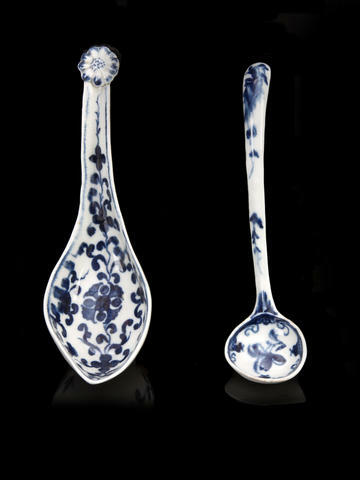 A Worcester rice spoon and a salt spoon, circa 1760-70. Estimate £500 – 800 (€650 – 1,000). Photo Bonhams. 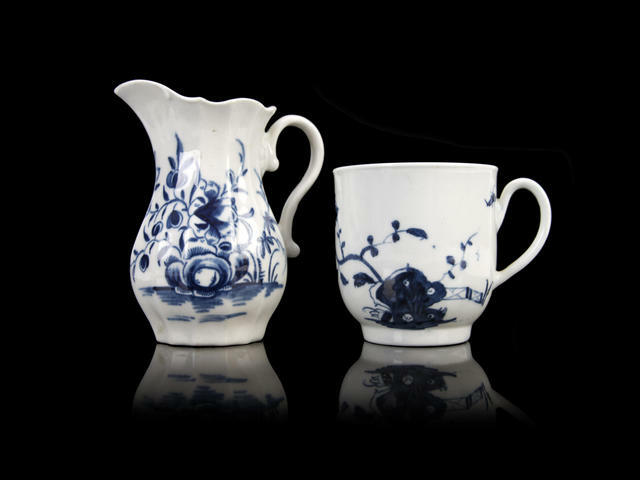 A Worcester faceted cream jug and a coffee cup, circa 1775 and 1758. 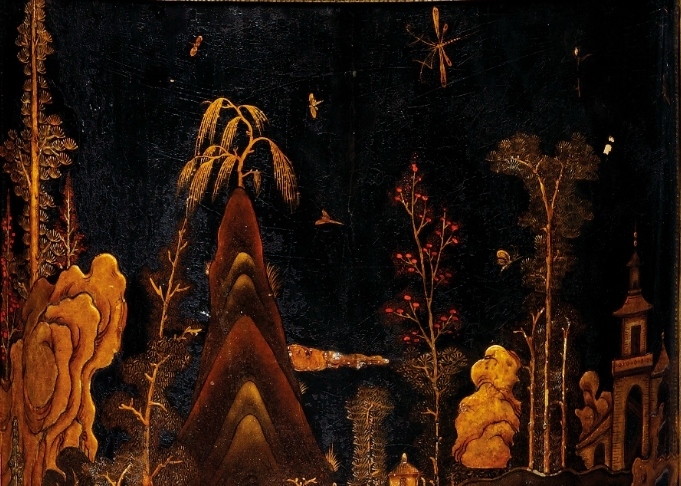 Estimate £500 – 800 (€650 – 1,000). Photo Bonhams. 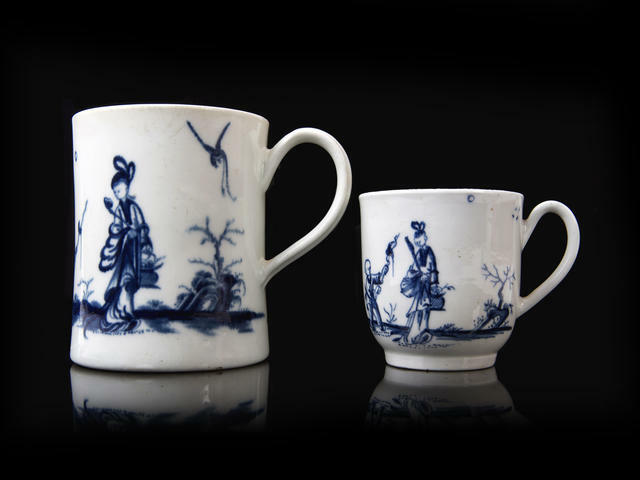 A Worcester coffee cup and a small mug, circa 1760-65. Estimate £500 – 800 (€650 – 1,000). Photo Bonhams. 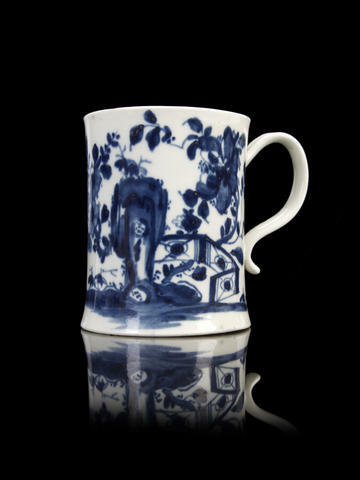 A fine Worcester mug, circa 1757-8. 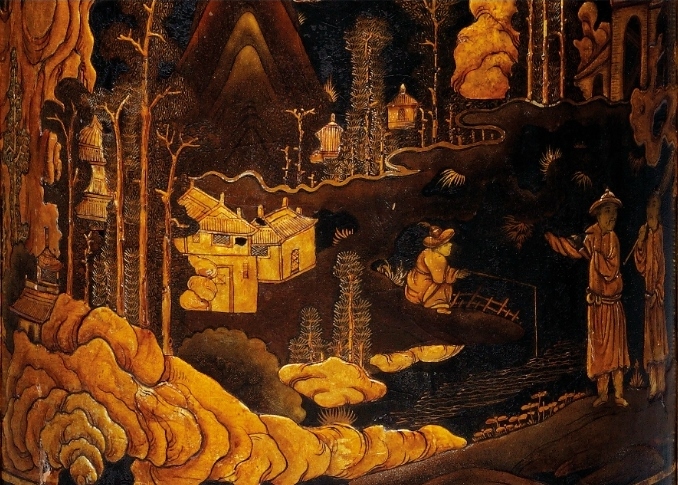 Estimate £600 – 800 (€780 – 1,000). Photo Bonhams.